“So much happened before Lewis and Clark dropped in…” Or so could read the teaser for a Broadway musical based on this week’s read, Before Lewis and Clark: The French Dynasty that Ruled America’s Frontier by Shirley Christian. I have been fascinated by the adventures of Lewis and Clark since I was a little boy, and I had never really thought much about what the American west was like before their exploits. I mean I knew the Native Americans were spread throughout the land, and various Spanish explorers and French fur traders had popped in and out, but I had no idea of the vast empire of the Chouteau dynasty that set the stage for the settling of the great plains and beyond. 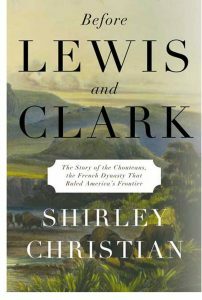 Before Lewis and Clark by Shirley Christian is available from Amazon and other fine booksellers everywhere. Lost Cowboy is powered by	WordPress 5.0.4 and delivered to you in 0.871 seconds using 40 queries.